In the realm of business, Digital is fundamentally shifting the playing field in two fundamental areas. Internally, Digital will automate and improve many complex operations within a company and also will produce valuable insights through advanced analytics. Externally, Digital will shift the balance of power from the company to the consumer via the unparalleled real time access to information that the customer now has. This is not a futuristic vision of Digital, it is firmly planted in the present and the impact is already being seem across all industries. Due to the speedy change happening across the globe, many firms are scrambling to figure out what to make of Digital and how fast they should address the many facets of Digital. For those who have consulted or worked within a large firm you know what it’s like trying to proceed with change quickly. Firms that I have visited are constrained in many ways when it comes to digital transformation, much of it based on culture. The first constraint I am seeing is that the folks who are needed to support automation are the same people who have the real possibility of their jobs being eliminated. I am seeing a lack of motivation on their part, but this is not all that unusual when a third party comes in talking about change. The second constraint is the lack of organic skills in the area of automation. Yes, firms can partner with a vendor with expertise on the data side, but someone needs to know how to build the data lakes and what information should be included. That takes deep company operational knowledge. If they are lucky enough to get quality insights, firms are missing the key competency needed to match the insights with the opportunities to automate. The slow and cautious approach to digital transformation has a lot to do with culture and the sense of urgency. Culturally speaking, companies are certain that it can deliver value especially in the area of cost control and productivity, but are in no rush to disrupt themselves in the process so they prefer to take a risk averse approach. Instead of aggressively pursuing their digital initiatives they instead take a cautious approach and run every decision through their bureaucratic and often times political strategy and approval boards. Public companies have to be risk averse if they want to keep their shareholders happy. Risking loss of margins due to digital initiatives that aren’t guaranteed is not something most CEO’s are comfortable with. When it comes to the sense of urgency, firms that have not yet adopted a digital approach to business are likely thinking that the digital impact will proceed similar to that of ecommerce or the internet for that matter. Those phenomena were indeed moving at a speed that allowed most companies to react in a traditional cautious and slow moving manner. Digital is different. Analogue companies are losing to their smaller digital native competitors in record numbers. The number of publicly listed U.S. stocks peaked at a record 7,562 in 1998. Today, there are just 3,812. Corporations are seeing loss of revenue and shrinking profit margins that are similar to what one would expect during a full on recession. The impact is seen across all industries and all sectors. While B2C firms were the first to feel the impact, B2B firms are also feeling the effect. 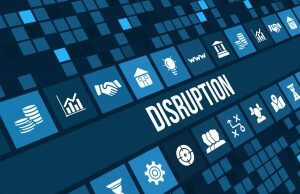 The difference is that B2C firms have recognized the true source of the disruption while B2B firms continue to blame more traditional macro-economic forces like the price of oil, currency fluctuation and the like. (Just take a listen to a company quarter/year end webcast to shareholders and hear their rationale) Truth is that small firms who once had to wait 10 years to even think about competing with the larger firms are now able to challenge their position of prominence. How are they doing it? The confluence and maturation of several key forces of technology is obliterating past barriers to entry and allowing small firms to get to the starting line quickly. Not only that, once they are in the game, they have a distinct advantage over their larger competitors. They can move at the speed of thought and larger firms simply do not have the culture or agile processes to keep up. Layers of management and bureaucracy have led to slow and lethargic change when in fact a fast speed of change is what is needed most right now. What are the forces we speak of? Mobile, Social, Cloud, Big Data/Advanced Analytics and the Internet of Things. Although not a comprehensive list, these forces are changing every aspect of business including how we operate within our company and how we interact with our customers. It is a dramatic shift from the past. It is a large incumbents biggest threat, but could also be its biggest opportunity. Unfortunately Digital is not friendly to late adopters or laggards so the time for change is now. Unfortunately I think we are seeing the end of the traditional corporation. There will be a distribution of power across industries that is less hierarchical and very democratized. This will lead to much less opportunities for those who are working in manufacturing and many more opportunities for entrepreneurs. Joe, I can see the passion here. Looking forward to more articles.